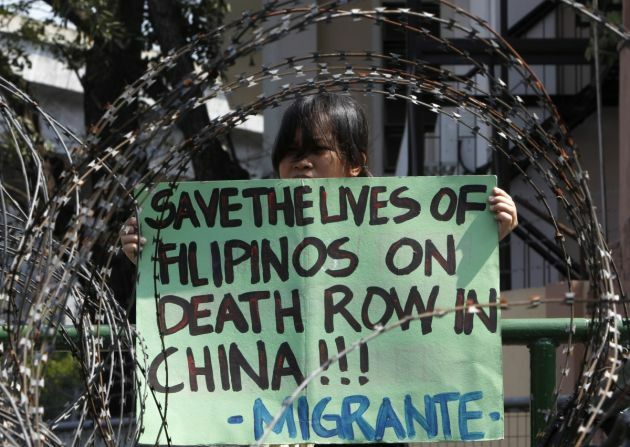 (Photo: REUTERS / Romeo Ranoco)A member of Migrante International, a Filipino migrant organization, displays a placard demanding legal assistance for her relatives during a protest outside the presidential palace in Manila February 21, 2011. China has postponed the execution of three Filipinos after Vice-President Jejomar Binay flew to Beijing and appealed to stay the execution. Two women and a man are expected to be executed in two southern Chinese cities for drug trafficking. Pope Francis has issued an impassioned video plea in support of advocates against the death penalty saying it is an "offence to the inviolability of life and to the dignity of the human person." The head of the Roman Catholic Church issued his video message June 22 as the Sixth World Conference Against the Death Penalty was taking place week in Oslo, Norway. His pleas comesat a time when the number of those subject to capital punishment is dramatically rising globally. "Nowadays the death penalty is unacceptable, however grave the crime of the convicted person," the Pope said. Amnesty International says that 2015 saw a dramatic rise in the number of people executed - at least 1,634 - the highest recorded it has recorded since 1989. "Countries used various methods to kill: hanging, shooting, lethal injection, beheading. They did this with cold efficiency, driving the number of executions up by more than half, compared to 2014. "Nearly 90 percent of these happened in just three countries: Iran, Pakistan and Saudi Arabia. But these figures exclude China, where numbers remain a state secret," said Amnesty. Francis said the death penalty "contradicts God's plan for individuals and society, and his merciful justice," not does is it consistent with just punishment. "It does not render justice to victims, but instead fosters vengeance. The commandment 'Thou shalt not kill' has absolute value and applies both to the innocent and to the guilty." The pontiff encourage people to work not only for the abolition of the death penalty, but also to improve prison conditions, so that they fully respect the human dignity of those jailed. "'Rendering justice' does not mean seeking punishment for its own sake, but ensuring that the basic purpose of all punishment is the rehabilitation of the offender. "The question must be dealt with within the larger framework of a system of penal justice open to the possibility of the guilty party's reinsertion in society," said Francis. He noted there can be no fitting punishment without hope as such a type of punishment is type of torture. In its yearly assessment on the death penalty Amnesty saw some signs of hope despite the spike in executions. "Four countries expunged the death penalty from their law books for good so that today, more than half of all countries in the world have turned their backs on this cruel, inhuman and degrading punishment," said Amnesty International.